Health care reform means many things to many different people -- to the indigenous people of the U.S., the issue is perhaps even more weighted. 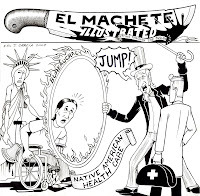 An article recently published on Truthout by Frank Joseph Smecker lays out the ugly truth behind the Native American struggle with federal government health programs. Native American and Alaskan peoples suffer from some of the worst poverty-, unemployment-, cancer-, diabetes-, obesity-, infant death-, and age-adjusted death-rates in the country. The bankrupt state of their government-funded medical centers have only exacerbated these economic and medical problems. But looking back on the history of U.S. government involvement in Native American affairs, it comes as no surprise that the article's author reached the conclusion that in any health care reform act that is passed today, Native Americans and Alaskans will surely be left behind. Evidently, with the outbreak of contagious diseases in the 19th century, the federal government began a program aimed to "prevent disease and to speed Native American assimilation into the general population by promoting Native American dependence on Western medicine and by decreasing the influence of traditional Indian healers" (Kuschell-Haworth, qtd. in Smecker). From 1859 until 1976, the program continued under various names and in various governmental departments, eventually ending up as part of the Department of Health and Human Services as the Indian Health Service (IHS). Along the way, in 1948, one of the most appalling attempts at (literal) assimiliation took place: an involuntary sterilization program that affected 40% of Native American women who were childbearing age. Smecker continues to relate the history of wrongdoing and delinquency on the part of the federal government: the lack of funds, the unrealistic appropriation of services, and the toxic mining and dumping occurring on reservations. A slim ray of hope glistens at the end of his report: two state representatives (from New Jersey and New Mexico) have spoken out about including a provision in health care reform to cover Native Americans. But, as Smecker points out, any truly respectful amendment would also embrace traditional methods of healing. Read the entire article on Truthout. Labels: anthropology, health, indigenous issues, poverty, U.S.